Come and Join the excitement. 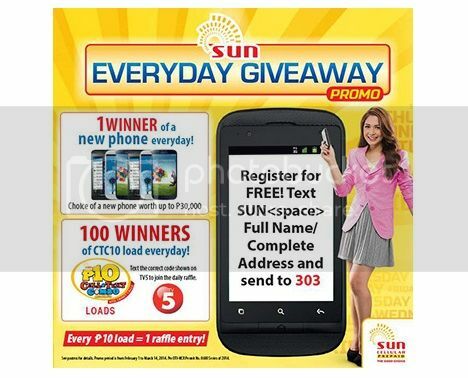 Sun Cellular Everyday Giveaway Promo 2014 gets you a chance to win a new phone daily and be 1 of 100 winners of Sun CTC10 loads everyday! What to do the get this free gadgets and sun load? Simply register SUN Everyday Giveaway Promo and get a e-raffle entry! Join Now! See mechanics below. – Text SUN FULL NAME/ COMPLETE ADDRESS to 303 for FREE! – and Get one (1) e-raffle entry for Php10 load. – Just Text the correct code shown on TV5 to join the daily raffle. This Sun Cellular Promo runs until March 14, 2014 only. Per DTI-NCR Permit No. 0600 Series of 2014. For more details you can visit Sun Cellular Prepaid Facebook page for latest updates.